The Company from Bergara is the leader of the German forging tool market, which is globally second only outrivaled by China. Lazpiur presents leading edge dies and punches for gear manufacturing in a prominent location in Hall 4, Stand G12, under the coordination of Bilbao's Chamber of Commerce. With more than 5,000 exhibitors and 180,000 visitors from more than 100 countries, the Hannover Messe Exhibition is held from 13 to 17 April showcasing the leading multinationals in the sector. Shoring up leadership in the forging tool German market, the most relevant in Europe and number two in the world. This is Lazpiur's objective in Hannover Messe, the most important Exhibition worldwide, which this year is held from 13 to 17 April. The company seated in Bergara (Gizpuzkoa) is the main supplier of forging tools in Germany, predominantly targeted at the automobile industry. Hence, Hannover's Show is an opportunity to showcase new products. This year, Lazpiur exhibits the new generation of punches and dies for the manufacturing of gears and splines. These are top quality, cutting-edge technology products which result from the Company's last investment in a high speed machining centre by the German Company Hermle. The Basque company stands out in the supply of comprehensive solutions and in the manufacture of both wear and standard tools based on high innovation and specialization standards. Lazpiur will be exhibiting in Hannover in cooperation with Bilbao's Chamber of Commerce in Hall 4 (Stand G12) devoted to industrial subcontracting. The company, with headquarters in Gipuzkoa, will have a prominent 16 sq. m area on an excellent location by some of the forging industry multinationals such as GKN, HAY or HBS. Some of them are the Company's customers and others are competitors. India is this year's Partner Country. Significantly, Lazpiur already operates in this Asian subcontinent after the recent agreement entered into with the Kriti Group multinational for the supply of standard tooling for all types of automatic presses for cool, warm and hot forging alike. In addition, Lazpiur's reputation in Germany has been boosted by last year's invitation to the International Forging Congress (IFCE) held in Berlin, where the Basque company was the only speaker of the tooling industry worldwide. Germany is the second most relevant country for the forging industry, only outrivaled by China. Then India and Japon would follow. 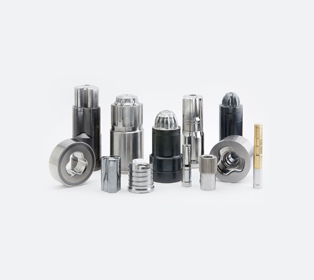 Lazpiur stands out in the company's sector through a wide range of products, including not only wear tooling (punches, dies, ejectors, drop forging tools, shear knives, etc.) but also larger standard tooling such as wedges, blocks, holders and die plates. The company from Bergara operates in more than 25 countries, and supplies to companies like Mercedes, Volkswagen or Ford, in addition to Tier-1 suppliers such as GKN, Hirschvogel, FAG and HAY Group.